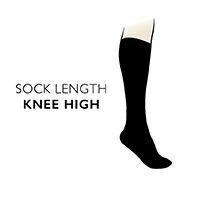 If you expect more from your knee highs than looks, you’ll enjoy the exquisite softness of these great Elle Wool Blend Knee High Socks, made in a viscose/wool mix that delivers a fine, soft and silky yet superbly warm knit. The tops have a double layered stretch welt to keep them securely in place without undue tightness, while right at the other end, hand linked toes for smooth seams increase the comfort level and luxury feel of these socks even more. Elle Wool Blend Knee High Socks are finished with an embroidered Elle logo at the side of the calf. For a shorter leg sock with the same great feel , try our Wool Blend Plain Socks or Wool Blend Stripe Socks.